It is unique and surprising that every film hero in Tamil Nadu ultimately aspires to enter politics and aims nothing less than chief minister's post. This must be the queer influence of the erstwhile Dravida Kazhaga Parties. Their entry into politics was via cinema including for the nonagenarian Mu. Ka. MGR and Jayalalithaa were other standing testimony to this. We, therefore, have a host of aspirants from late Shivaji Ganesan to the present day Vijaykanth, T Rajender, K Bhagyaraj, Ramarajan, even a smallest of the small fry like Karthik and Seeman. Of these lot, except Vijaykanth who provides ample comedy with his party DMDK, Karthik who is still continuing with a laughable number of followers and always angry and vociferous Seeman, others have gone into oblivion. Among the two most popular actors Rajinikant and Kamalhassan, the mass hero Rajini was all along sending many signals of entering politics through his films with punch and suggestive dialogues now totally back tracked. Conversely, Kamalhassan who was keeping away from politics for long, all of a sudden jumped into the fray with strong political comments leading to lot of debates. Among the next gen actors Vijay undoubtedly seems to have aspirations to enter politics and most of his movies are centered on him as a Samaritan or a leader who fights for the poor and deprived. The formula is all set and the templates will be more or less the same except for the change of heroine or villain. 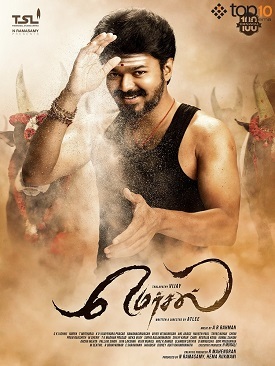 Vijay’s recent offering ‘Mersal’ (a new addition to Tamil vocabulary meaning ‘zapped’ according to the movie’s subtitle!) is no different. But the problem with this particular movie is the screenplay; it is nothing but a bad hotchpotch of many of the popular early films like Gentlemen, Indian, Ramana, Apoorva Sahodarargal to be specific. Yes, the social message here is that every Indian (read poor) should get free medical help through all government hospitals. The vagaries of corporate hospitals (some true and many untrue) are lambasted and the villains are beaten mercilessly and terminated in gruesome manner by the heroes Vetri (a magician) and Maran (a medical doctor who treats his parents for a mere Rs.5). Vijay plays triple role in this movie. Dialogues like ‘in a country like Singapore where the GST is only 8% where medical treatment is free while in a ‘poor’ country like India where the GST is 18.5% the doctors loot the patients (again read poor) are reeled out creating hot debates in Tamil channels and media. As a movie it has very little to offer in the name of entertainment because it is loud and the macabre scenes of murder and mayhem are disgusting. The logic goes for a toss when showing the twins on many scenes and incidents. Director Atley and actor Vijay have turned the audience for a ‘royal super ride’ with fights, songs and ‘profound’ dialogues. The only saving grace of the movie is Vijay who looks handsome, trim and agile. Computer graphics have been used to the extent possible to create make believe world and sequences. So what? The Tamil audiences are ready to appreciate such mindless extravaganzas as not only entertainment but also movies with great message. I doubt whether even God can ever save India and especially Tamil Nadu!